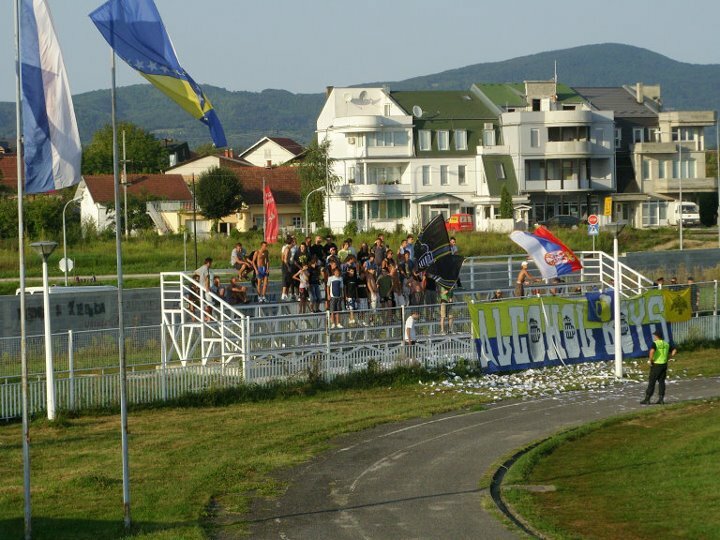 The fanatic fans of the Serbian club Rudar named themselves the Alcohol Boys. Football and alcohol are such a perfect match that most fans can hardly picture one without the other. 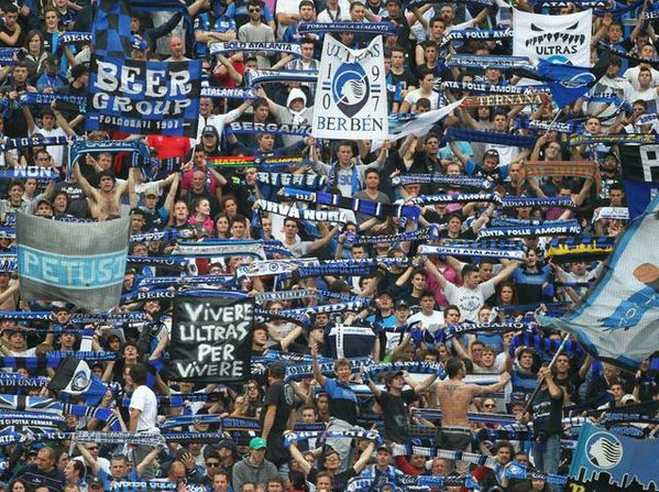 It doesn’t matter if you drink to calm the nerves, get an energy boost, socialize with the lads or simply soften the soar throat from the singing, alcohol is an absolute must at matches. It’s fun to see how fans from all over the world add booze into their style of support in a creative way. From simple banners with beer glasses to the name and identity of a whole fanclub. We searched the web for you and selected the best alcohol related banners. Enjoy! 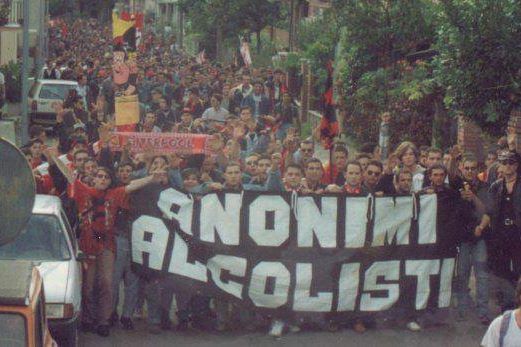 Banner at Atalanta Bergamo (Italy): Beer Group. Beroe Stara Zagora (Bulgaria) believes in the power of the national drink rakia. 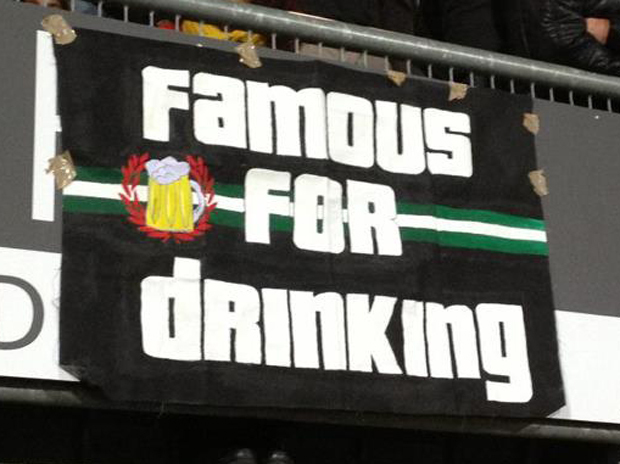 Nice beerflag at Borussia Mönchengladbach (Germany). 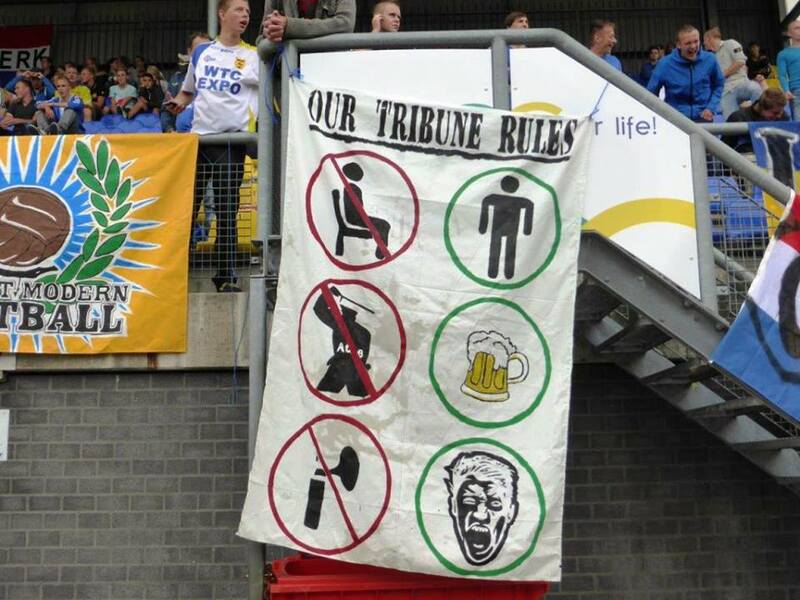 Cambuur Leeuwarden (Holland) shows how they feel football matches should be experienced. 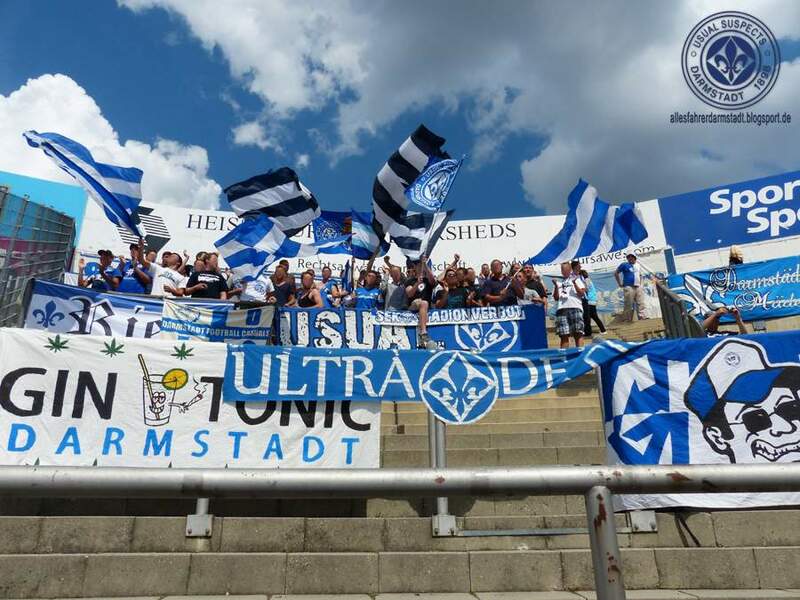 Great Gin Tonic banner by fans from Darmstadt’98 from Germany. 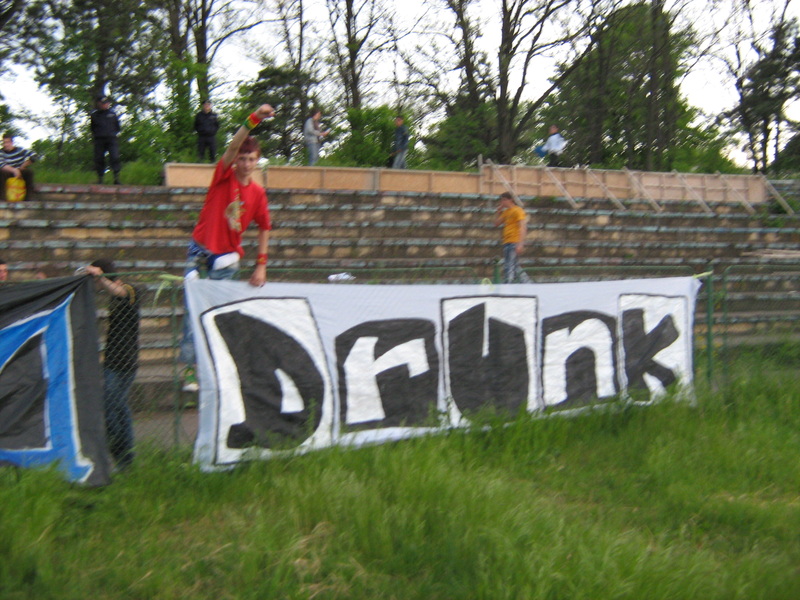 A fanclub of the Romanian team FC Delta Tulcea goes by a name that is as simple as it is great: Drunk. 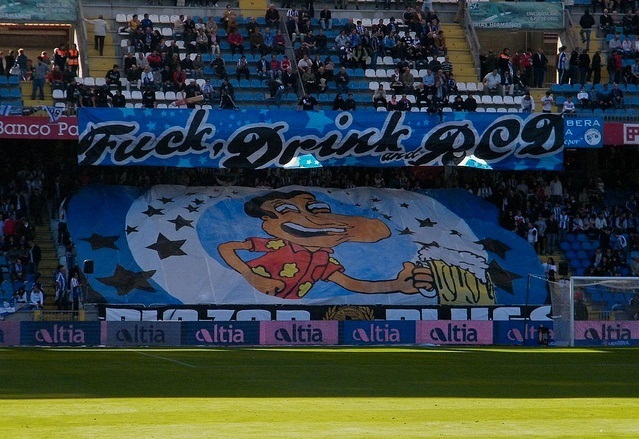 Fans of Deportivo la Coruna (Spain) really outdid themselves with this tifo. The text basically says it all. Small banner at Feyenoord Rotterdam (Holland). Another banner by Feyenoord Rotterdam. P.M.D.S. stands for Pre Match Drinking Session. 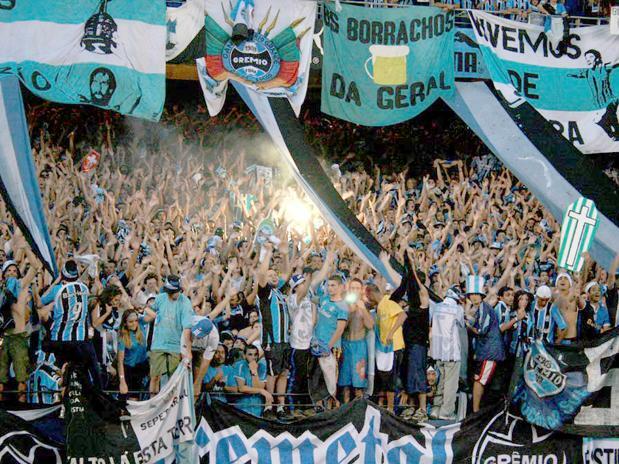 These are fans from Gremio (Brazil). 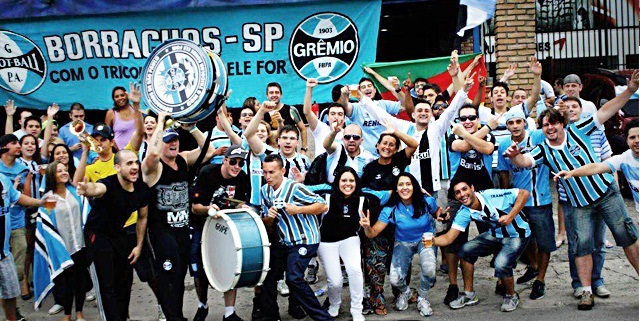 One of their fanclubs is named ‘Borrachos da Geral’, which means the drunks of the general. More Gremio. 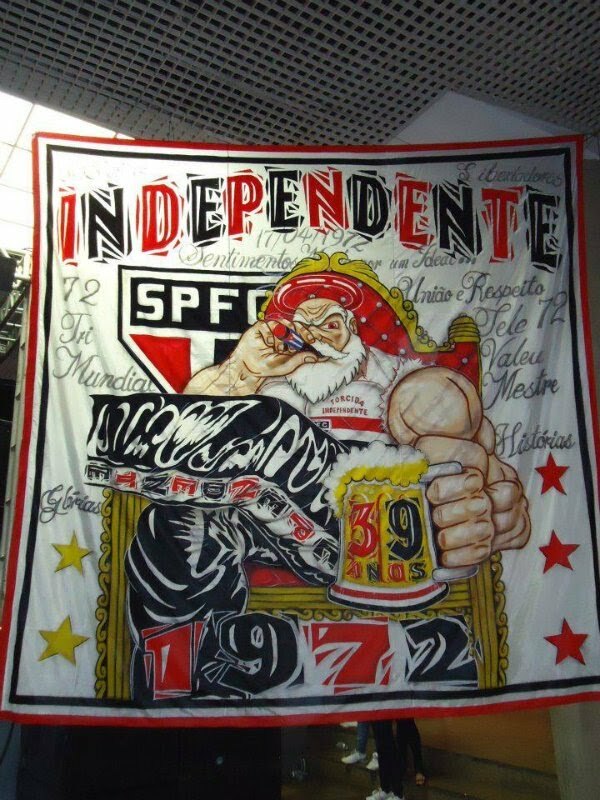 This fanclub is simply named Sao Paolo drunks. 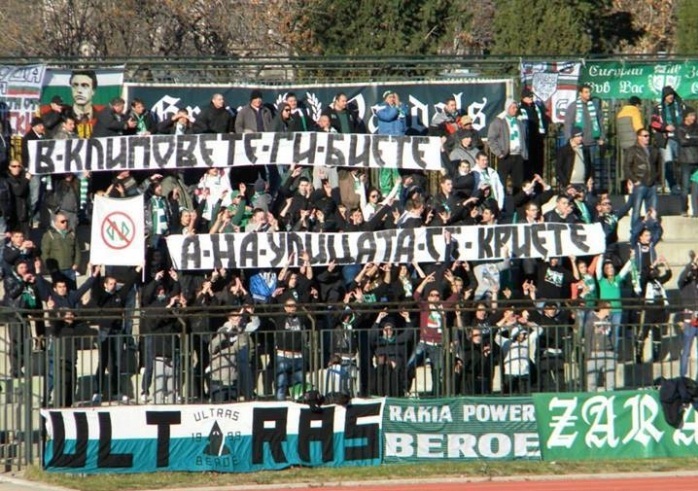 The text on this banner by Komiti Skopia (Macedonia) basically speaks for itself. 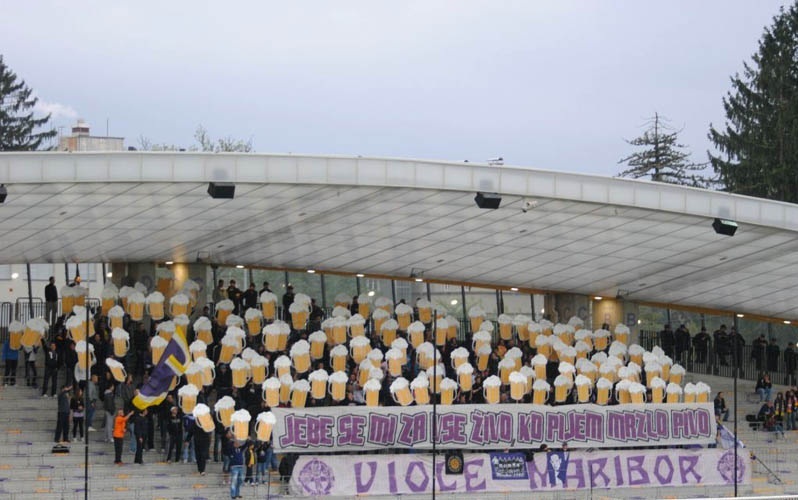 It’s not hard to tell what these fans from NK Maribor (Slovenia) want: beer! 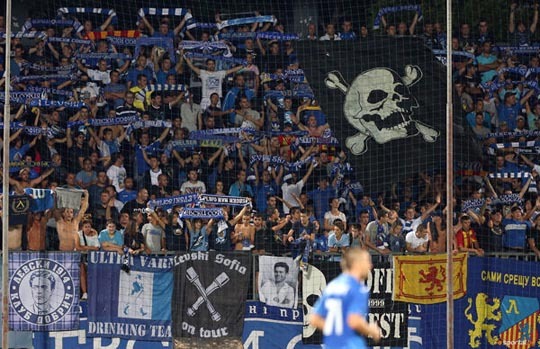 An interesting flag of the fanclub Ultra Varna of the Bulgarian club Levski Sofia who refer to themselves as the Drinking Team. Beautiful beer-tifo by MVV Maastricht from Holland. Another tifo from Holland. 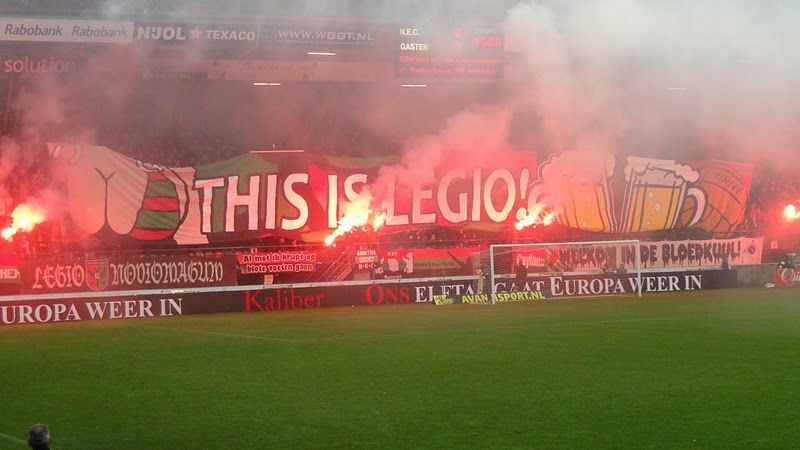 This is NEC Nijmegen. Brilliant banner for a march. These fans support Nocerina from Italy. Amazing tifo by Panathinaikos (Greece). They managed to squeeze the name of their fanatic fans Gate 13 into the logo of a famous beer brand. And we stay in Greece. This is PAOK Salonica. Their banner says singing and drinking. PAOK-fans are known to mix cola with a cheap Greek retsina called Malamatina. This cocktail is called Touba Libre, after their stadium Touba. 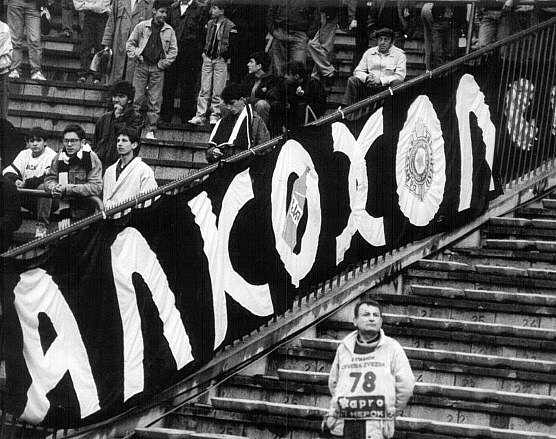 An old school banner by Partizan Belgrade. For the people that can’t read cyrillic: it says ALKOHOL. 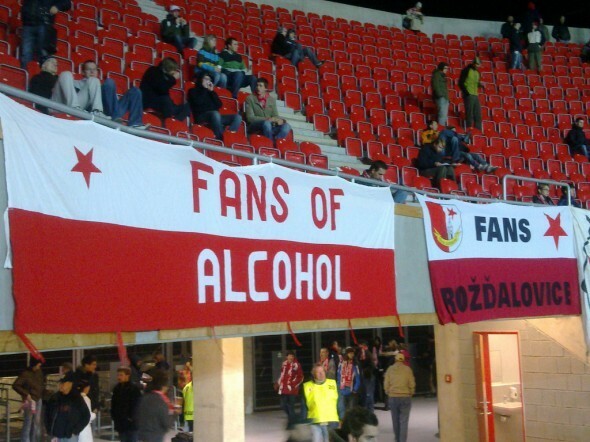 Banner by fans of Red Star Belgrade for their player and notorious drinker Zoran Riznić saying “Rizna cheers”. 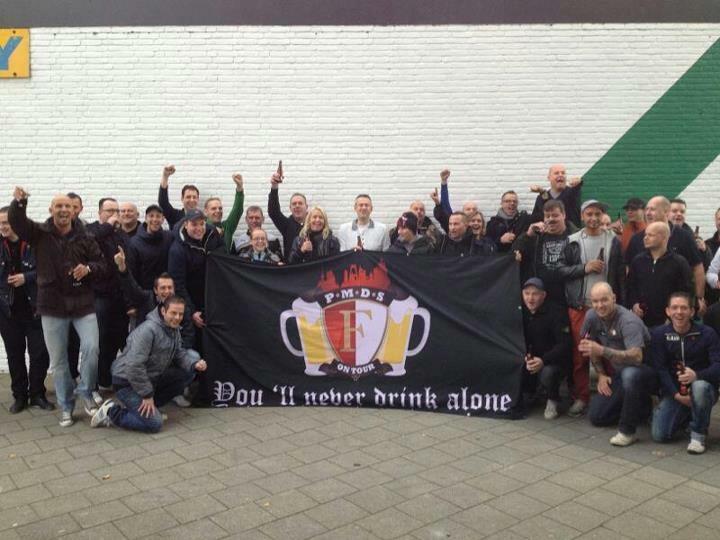 Fans of the Czech club Viktoria Plzen on tour in Turkey label themselves as ‘alcoholtourists’. There’s that word again; borrachos. 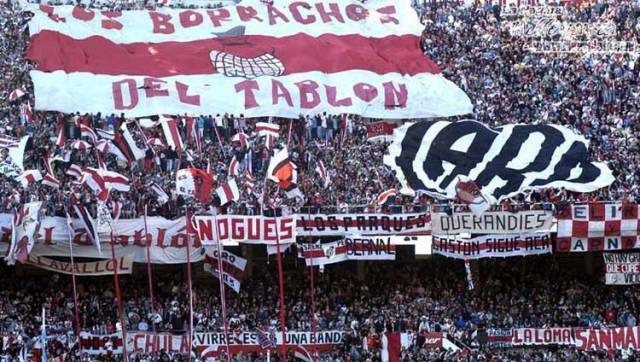 These fans support the Argentinian club River Plate and they call themselves the ‘Drunks of the terrace’. 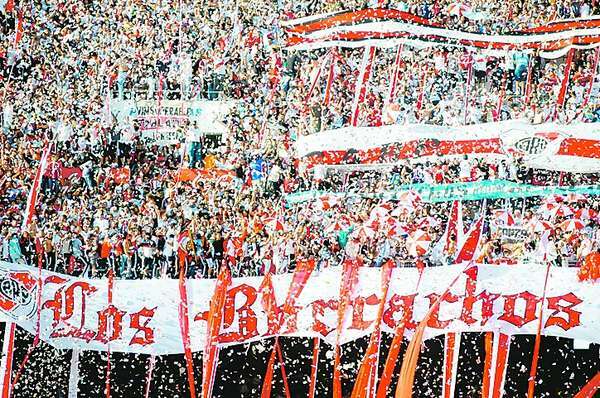 Another great banner by the River Plate fans. And let’s have a third one of the Drunks of the Terrace. The Argentinian atmosphere is simply unreal. 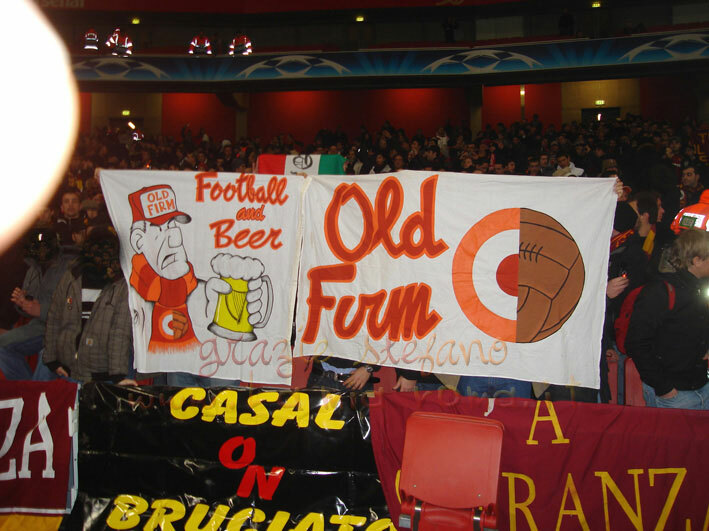 Nice beer banner by AS Roma from Italy. 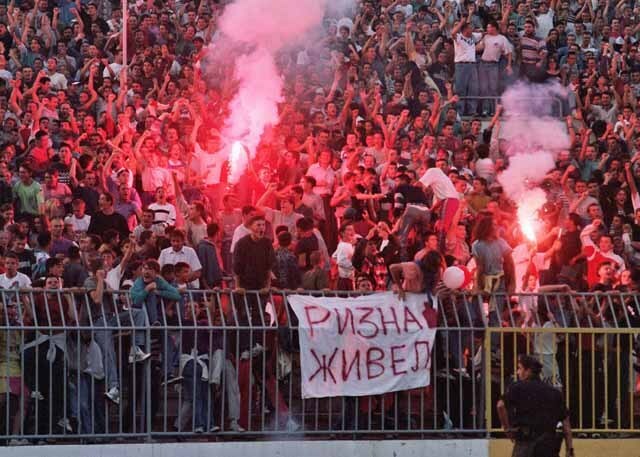 Fans of Rudar Prijedor (Bosnia and Herzegovina) call themselves Alcohol Boys. A closer look at their banner. What a great name for a fanclub. Nice flag from the Brazilian squad Sao Paolo. Simple message, but a good one. This is Slavia Prague from Czech Republic. 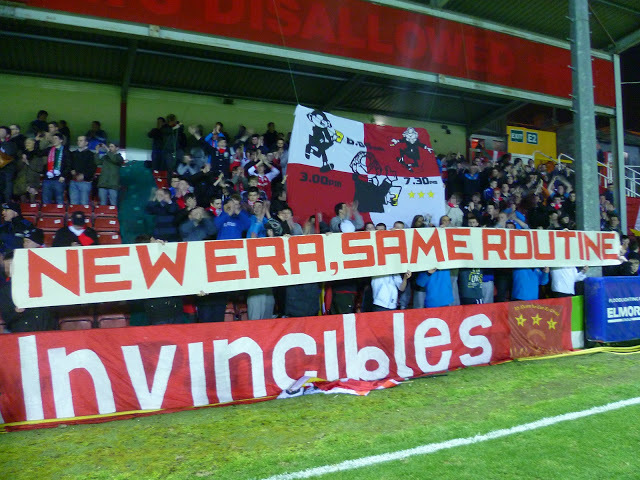 Beautiful tifo by Irish side Sligo Rovers. 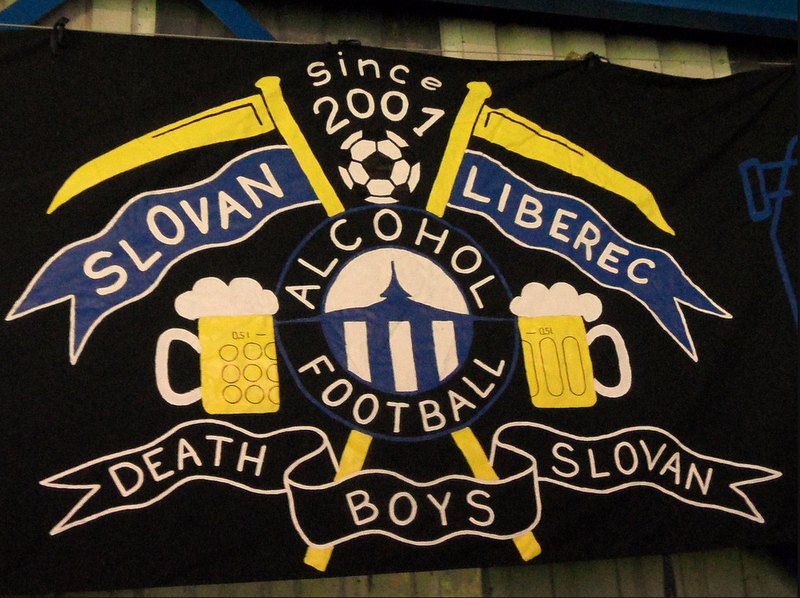 The fans of Czech club Slovan Liberec made this wonderful flag. Nice flag by the Irish side St. Patrick’s Athletic F.C. 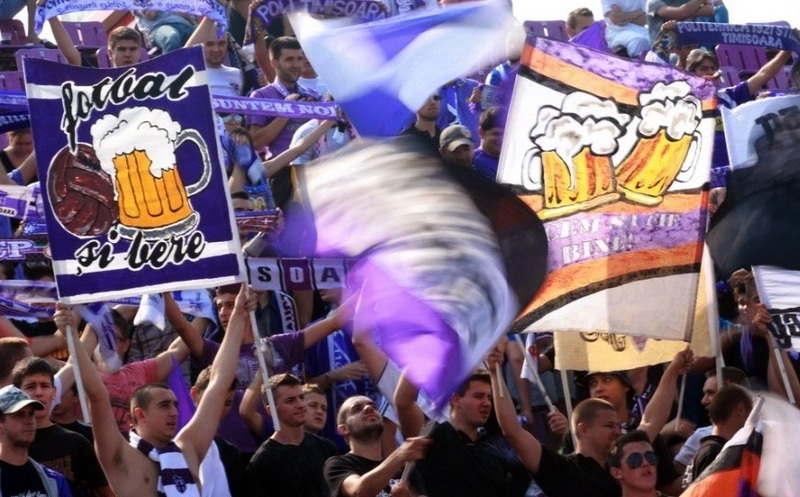 The Romanian fans of Politechnica Timisoara make sure there is no doubt about their favorite hobby besides football. 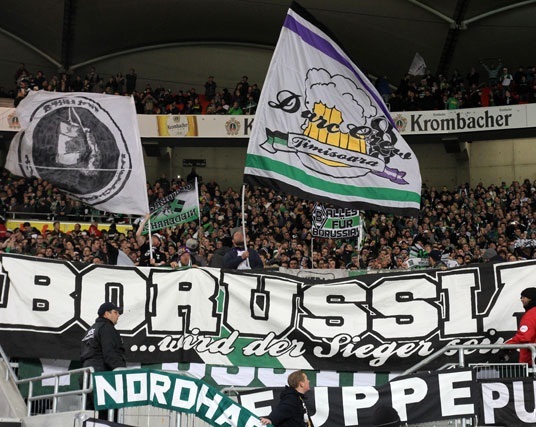 Nice banner in the section of German team Werder Bremen. 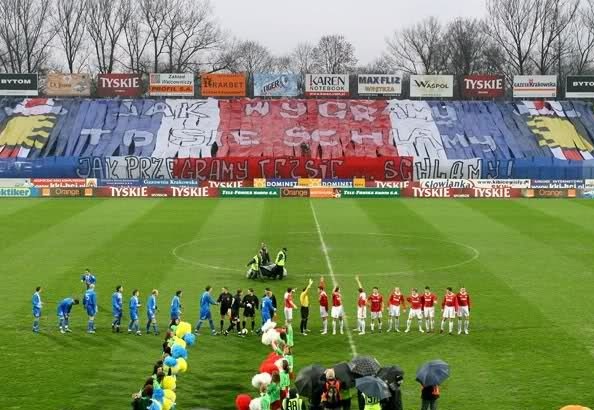 An epic tifo by Wisla Krakow. In the Polish it says: “If we win we drink. If we lose… we drink”. 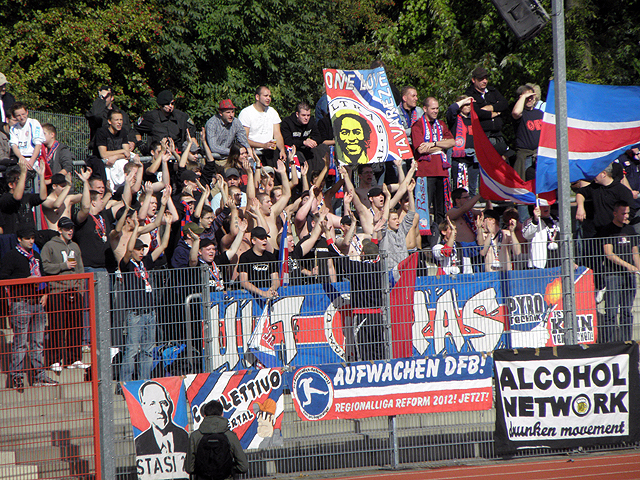 Cool flag by the small German team Wuppertaler SV. The fans are connected to the Alcohol Network. Well that was our collection so far, but as long as we have a working edit button it doesn’t have to end here. 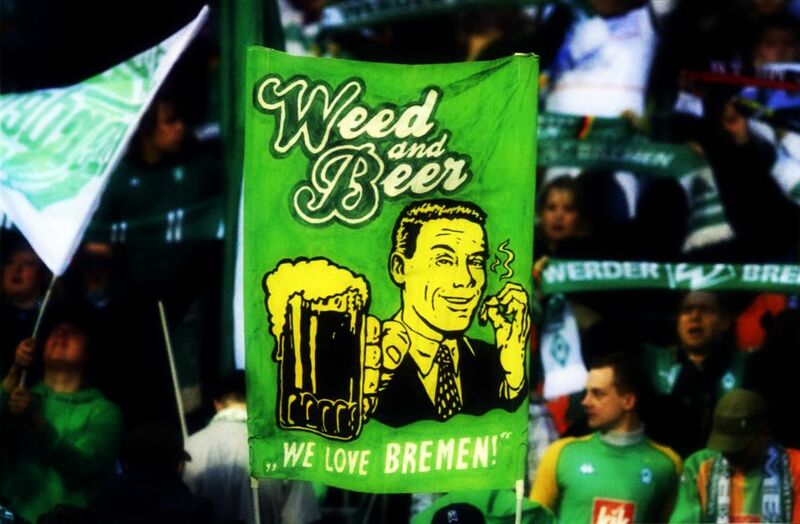 Have you seen some cool banners, flags or tifo’s that were alcohol related, please hook us up. You can reply below or send an e-mail to lordsofthedrinks@hotmail.com. Fun banners. I don’t have a banner, but I may design one. I believe is a great with pretty much anything: writing, reading, drawing, painting, cooking, etc., etc., etc. I’ve spent this afternoon and evening writing and scheduling my blogs wity accompanying haiku for this week, and I assure you the one thing that has kept my in my seat and on task if my bottomless supplly of Pinot Noir . Very sorry Edina… It’s a Serbian club in the Bosnian league. My mistake. The story behind it: Zoran Riznić aka Rizna was a quality player in mid 90’s, well known for his drinking habits. He was supposed to play for some kind of World XI in Russia back then, but didn’t show up for the departure. Urban myth goes that he drank himself unconscious, but he claims it was just a matter of misunderstanding (he talks about it in the second article). Anyway, he never tried to hide his habits and got sacked rather soon after coming drunk to a training yet again. Rizna is still held in high esteem here and media occasionally like to make a story about him and remind us of those days. Hahahaha those are the heroes in football we are looking for. I love it, thanks! Banner has been added (thanks again). I also want to make a post about “cult heroes”. Most clubs have had one like Rizna who would drink like a fan. If you have any more suggestions I’m glad to hear them.